Christmas time in my Grandmothers was marked by a hunt. It was her search for addresses for friends both at home and abroad, addresses she had scribbled on scraps of paper or cut from an envelope and squirrelled away. Some were in the glass case, others in her box of writing paper, while others were stuffed into an old tea pot. Matters were made worse because she never threw out an address, even if the person had long vacated and moved to a new address. Each year was the same vexatious search, so much so, that to us it became part of the tradition of Christmas. For Nanny however, t'was always a chore, and she would mutter and give out to herself, for not being more organised. As December moved on more and more cards arrived, and nothing gave her as much pleasure as sitting down to open and read the latest batch. You couldn't come into the house without getting an update from her. It was also a talking point for the neighbours, Margaret O'Leary or Bridgid Power would be interested to hear the happenings when they called in. Nanny would also make it her business to pass on regards if mentioned in a card, and would task us to remind her to tell Martha Fortune (RIP), Maggie Ferguson (RIP) and many others that such and such was asking after them. Now Christmas cards are all much of a muchness to me. Stereotypical images of Santa, decorated trees, fireplaces, loads of snow...and on it goes. 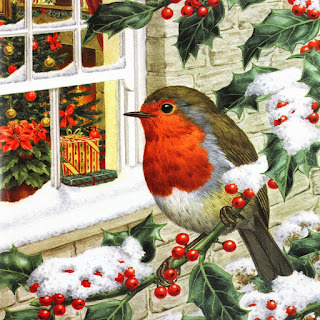 But of all the cards Nanny sent or received, the one card she loved most of all had an image of a Robin on it. "On the night of the birth of Jesus, he lay in a crib in the barn at Bethlehem. As the night grew on, the fire that kept him warm with his father and mother grew lower and lower and was at risk of going out. Both Mary and Joseph were exhausted from the journey and the occasion of the babies birth. The Shepard's had left and all was quiet. Mary turned to the horse in the manger and asked that he tend to the fire. But the horse, donkey, cow, and the sheep were all asleep and did not hear her plea. However she realised that something was stirring at the fire, when she heard a whirring sound. Glancing round she spotted a small little bird, beating away with its wings to fan the dying embers. As the fire flamed up, the little bird flitted about the barn, gathering straw, twigs and pieces of timber. The fire grew higher and stronger and the heat grew. They fell asleep in the comfort that the bird had created and next morning when they woke the fire was still going strong. Mary called the bird to her and perched on her finger, was surprised and concerned to see that in the work of stoking the fire, the little bird and burned itself and the breast was now red. In thanks for the deed of the little Robin, she decreed that forever more the Robin would keep the red breast in memory of the selfless deed."